~* West End Designs Journal *~: Cake or WHAT?????? Remember the "super secret" project I was working on last week??? Well I finished it. And here it is. OK, before you go "HUH??" and think I completely lost my marbles, I will explain. 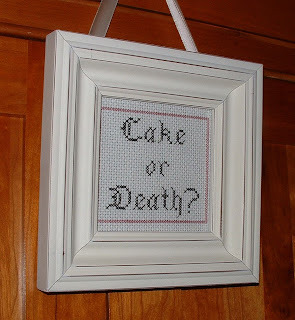 A few years ago, (when the book first came out) I fell in LOVE with Subversive Cross Stitch. I like the fact they are sassy and say what you really think, and the fact that the nasties are adorned with sweet bunnies and flowers make it just right! But I have a love/hate relationship with cross stitch. After stitching a 50th Wedding Anniversary sampler for my parents, I wanted to poke my eyes out with the little tiny needles and VOWED I would not ever do cross stitch again....... until I saw this book. I have a metric ton of sayings and they are quick enough to complete to just keep me interested and no fancy stitches!!! So, this saying??? What does it mean?? You mean you DON'T KNOW the comedian Eddie Izzard?? You should. Really. This man is funny. Really funny. He has been in a few movies and TV shows here in the States, but you NEED to see his stand up. That is some good stuff! Here is the "Cake or Death" clip from his show. Enjoy!!! Awesome! I love that comedy routine. *LOVE* it! Now how about "covered in bees!!!!" Melanie - Thanks!!! All his stand up is terrfic. I also like "Ich bein ein Berliner" too (I am a donut!!) Look that one up on YouTube! !